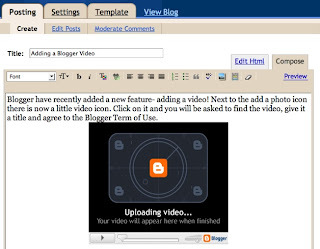 Blogger have recently added a new feature- adding a video! Next to the add a photo icon there is now a little video icon. Click on it and you will be asked to find the video, give it a title and agree to the Blogger Terms and Conditions. It will take a little while while it uploads the video and processes it so it would be best not to upload long movies! And there you have it. 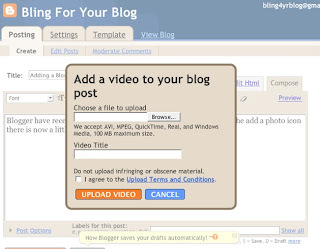 Your own video on your blog.